Kick your home and kitchen up a notch with premium range of appliances from Fujidenzo Warehouse Sale! The making of a great home goes beyond the furniture and decor. Having a stunning collection of reliable and modern home appliances is now essential for any living space. Whether you acquired a new place or began a kitchen renovation, shopping for these home solutions should not cost you an arm and a leg. 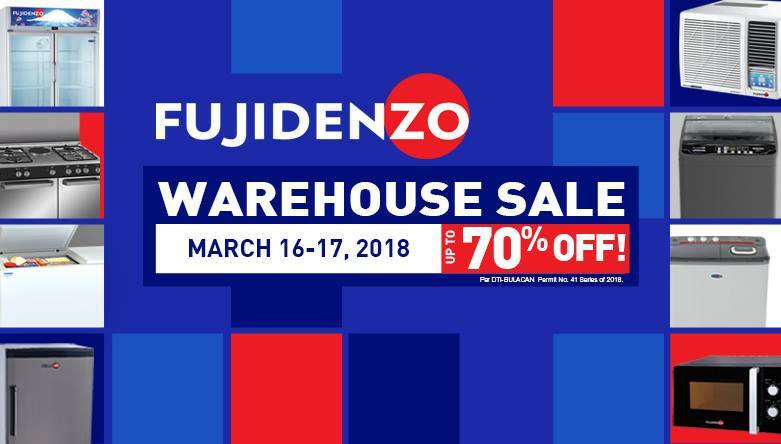 Catch Fujidenzo Warehouse Sale and score stunning pieces at a fraction of its price. Enjoy up to 70% OFF on chest freezers, chillers, refrigerators, air conditioners, washing machines and more! Visit them at their NEW warehouse located at Lot 3 & 5 Block 3 Phase 3 Thomasville St., Sterling Industrial Park, Libtong, Meycauayan, Bulacan. The sale event will take place on March 16-17, 2018 from 10:00 AM – 5:00 PM.